"The highlight of the trip was by far the four days we spent sailing from Marmaris to Fethiye. It was a fantastic way to relax and the crew totally looked after us with wonderful food and great spots to stop. A must is the sailing - we had fantastic weather." 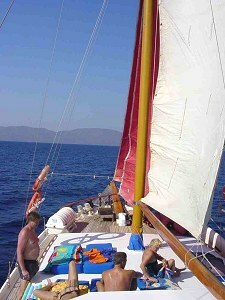 Fethiye to Marmaris sailing on the Mediterranean visiting secluded coves and islands, swimming, sunbaking and relaxing. All meals cooked and served on-board. We begin boarding the Gulet at Fethiye Harbour at 8:30 am and cruise to Gocek. Enjoy a relaxing afternoon swimming and tanning before cruising to Yassica Island. After breakfast, sail to the spectacular Bedri Rahmi Bay then to Sarsala Bay. 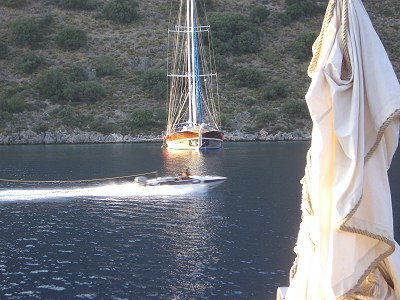 Cruise to Aga Limani for overnight stay. This morning we cruise to Iceada Cebekilise, cruising through Turunc for our swim stop in either Kadirga or Kumlubuk. Late this afternoon we arrive in Marmaris harbour for our final night onboard the yacht. After breakfast, we disembark at approximately 10 am. 8. This cruise finishes at Marmaris Harbour after breakfast on the final day at approximately 10 am.